The second phase of Ottawa's massive light rail project now has a budget of $3.6 billion, but it will extend farther than first planned. 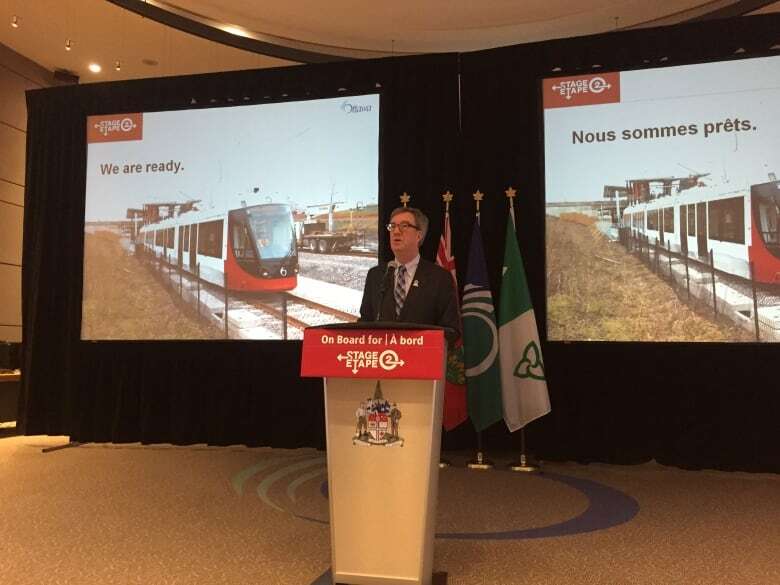 ​Ottawa Mayor Jim Watson has laid out fresh timelines for the second stage of the city's light rail project, and revealed plans to extend LRT farther west than earlier planned. 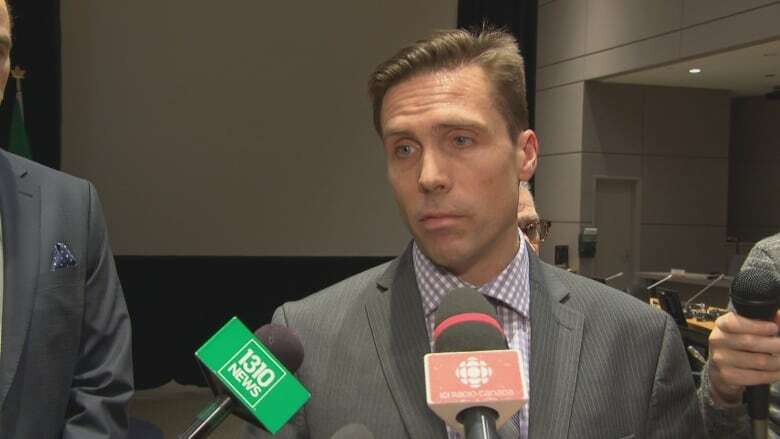 The details came at a technical briefing at Ottawa City Hall Friday morning. Politicians and other community representatives from Kanata were thrilled to hear LRT will extend from Tunney's Pasture to Moodie Drive, instead of stopping at Bayshore Shopping Centre. Construction on that portion of the system will also occur earlier than initially hoped, as the original plan was to not bring rail to Kanata until 2031. "We have a major employment node moving over to Nortel. If we don't get to that extension, what it does is add an extra transfer to all those people coming from the east and south," said Chris Swail, director of O-Train planning. The councillor for Kanata South, Allan Hubley, welcomed the announcement by blowing a train whistle. More progress! Gone from LRT planning post 2031 to trains on our doorstep in 2023! <a href="https://twitter.com/hashtag/KanataSouth?src=hash">#KanataSouth</a> Thanks <a href="https://twitter.com/WestOttawaBoT">@WestOttawaBoT</a> for all your support. The initial vision for far-reaching light rail was approved by Ottawa city council in 2013 as part of its transportation master plan. The whole idea was to branch beyond the tracks scheduled for completion in 2018, and add another 19 stations to the east, west and south. In June 2016 that plan was expanded by three stations, by adding a planned spur to the airport in the south and extending the line to Trim Road in the east, for a total of 36 kilometres of extra track. On Friday, an extra station was added at Moodie Drive, the new future western terminus. At the Friday briefing, the city laid out plans to complete construction in one direction at a time. The Trillium Line will extend from South Keys down to Bowesville Road, with a spur linking to the airport terminal from South Keys. That work will see the existing Trillium Line shut down for up to 16 months, from the end of spring classes at Carleton University in spring 2020 to the opening of the full line by the fall of 2021. The eastern LRT extension will end at Trim Road instead of Place d'Orléans, with a new station at Trim by 2022. The western LRT extension to Moodie Drive is slated for completion by 2023. The plan is for construction to start in 2018 — the mayor has said it makes sense for crews to move seamlessly from working on Stage 1 to working on Stage 2 — with the lines to be fully operational by 2023. City staff say the system is expanding beyond the original plans made in 2013 at no extra cost to city taxpayers. Stage 2 will now cost $3.6 billion, a projection that includes related infrastructure add-ons. The new work associated with the light rail project lifts the entire price tag from around $3 billion to closer to $3.6 billion, Swail said. More than half of that $600-million jump is due to the extra tracks and stations for Trim Road, the EY Centre and the airport, which are supposed to be borne by the federal and Ontario governments. Another $200 million relates to the widening of Highway 417 from Maitland Avenue to the split with Highway 416, which is a provincially funded road project. The second phase of light rail was always going to be more expensive than Stage 1 of the Confederation Line, which is due to open in 2018, and the money for the second stage is not yet secured. The Ontario government pledged in June 2016 to front more than $1 billion toward Stage 2, its one-third share of the overall project, then costed at $3 billion. The province also promised to pay half the costs of the new extensions — east to Trim Road and south to the EY Centre and the airport — provided the federal government kicks in the rest. The federal government has been making signals for months that it would commit money to Stage 2, but so far no announcement has been made. City officials remain hopeful for a clearer sign in the upcoming federal budget. 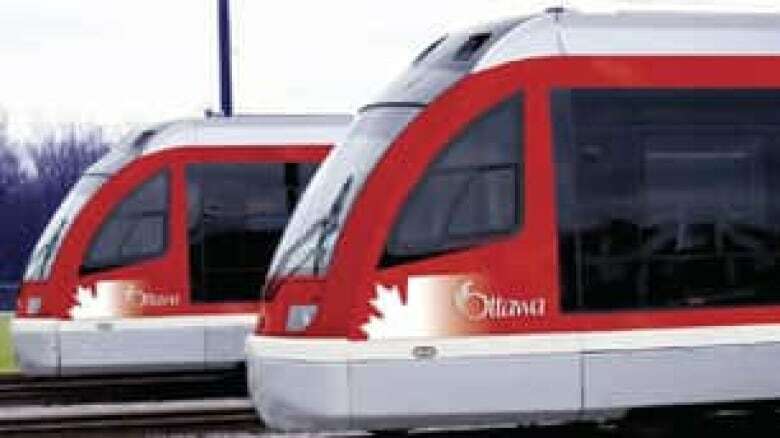 The report on the second phase of Ottawa's light rail project goes to a meeting of the finance and economic development committee on Feb. 24, to be followed by a vote at full council. Once council signs off, the city can issue a request for proposals. The Rideau Transit Group, which was responsible for building the first stage of construction, will not bid on a $2.5-billion contract to build the second phase of tracks on the east-west Confederation Line. It will, however, be allowed to bid to extend the Trillium Line to the south, a project worth $535 million. No consortium would have wanted to submit a bid if RTG was in the running, Swail said, because RTG would have had such an advantage. "So the fear for the city is, we could go to tender for the entire scope and essentially nobody shows up to bid against RTG. And that doesn't leave you with effective pricing because there's absolutely no competition. RTG would otherwise be able to dictate pricing for the city," he said. 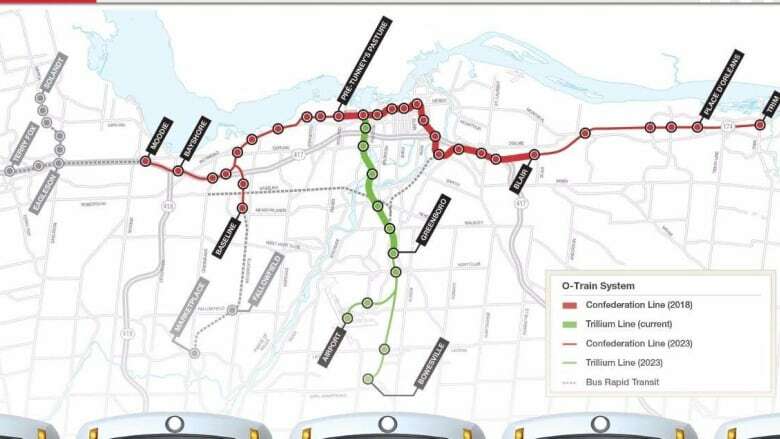 In addition to being allowed to bid on the smaller construction contract, Rideau Transit Group has also negotiated a $492-million memorandum of understanding with the city to supply 38 trains for Stage 2, expand the rail yard at Belfast Road, and oversee construction for whichever consortium wins the east and west extensions. Once all the construction is finished, RTG will also perform maintenance on the entire system for years.